Killian caught me with her Poetic series and I was afraid this one might not be good because of the different locale and heroine. No problems after I read the first few chapters, though I could've done without the prologue and the epilogue. A.J. Alexandra's aunt, Diantha or Di, is found murdered. At first the police suspect everyone, including A.J. and A.J. 's mother (Di's sister), Elysia Mason. More shocking than finding her husband's gay and in love with an FBI agent or Aunt Di's murder is the reading of the will, where A.J. discovers she's inherited roughly eighteen million dollars and is now owner of Sacred Balance. This ticks of Lily who's master instructor who firmly believes she should have the yoga studio. As A.J. adjusts to the small town lifestyle from Manhattan and the studio, she finds many in the town didn't like Di's outspoken tactics, from the local dairy farmer to the local grocer. But Elysia's determined they solve the case due to her years being on the show 221B Baker Street. A.J. doesn't think this is a bright idea and neither does delectable Jake Oberlin. To complicate matters, Elysia's trying to get A.J. and her ex-husband back together, despite the many times A.J. tells her mom about the divorce. Eventually, A.J. whittles down the list of suspects until there's only one remaining. I think I'm going to like this series. 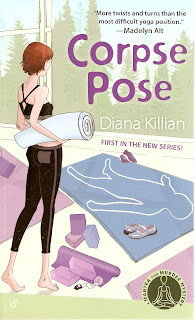 Killian is witty without being cliché or overbearing or too cute and even though yoga is a primary theme in the book, it doesn't bore the reader with it. When Jake asks about her divorce, she calmly replies "Oh, the usual … my husband decided he was gay and ran off with an FBI agent." I just love that line. A.J. is well-developed and grows steadily in the book as well as other characters. She comes to terms with her mother, her ex, and is warming up to Jake. The mystery was played out pretty good. Enough clues sprinkled throughout with enough suspects to explore and cross off. "A.J. discovers she's inherited roughly eighteen million dollars and is now owner of Sacred Balance. This ticks off Lily who's master instructor who firmly believes she should have the yoga studio."Heh. i kinda like Lily. more ticked off about the yoga studio than the 18 million dollars. I don't know how long Lily will stay in the series. She's not a very likable character and she and A.J. are butting heads. We'll see. The next one in the series is out now, but I'm pretty high on the list of people requesting the book, plus I've got tons in my TBR pile.